"I'M GOING to say something controversial. We live in a time of regression in racial relations. There's a lessening of the federal government's involvement in addressing racial relations, and cutbacks in both federal funding and commitment to enforcing existing laws. Today we have to think of improving racial relations at a local level." Photos courtesy of The Public Relations Board, Inc.
A major focus of the Oak Park Exchange Congress was racial integration and housing issues. Here, delegates leave the Village Hall to tour recently restored commercial buildings throughout the community. The speaker was James J. McClure Jr., and in his capacity as co-chairperson he was giving an opening speech at the sixth Oak Park Exchange Congress, an annual conference which attracts a national audience of people who are interested in racial integration. McClure, a lawyer who was Oak Park Village president from 1973 to 1981, added: "We hope this conference will help destroy the myth that those communities which are racially diverse go down the drain. Oak Park and other communities represented here are shining examples that this is untrue." It helps to know a bit of Oak Park's history to understand the origins and ongoing purpose of the Oak Park Exchange Congress. After the Chicago Fire, Oak Park was one of the first Chicago suburbs to prosper. It attracted businessmen who worked in downtown Chicago, just 10 miles due east. The village's schools, libraries, mansions and cultural offerings ranked among the nation's finest. Adding to Oak Park's grandeur was the fact that famed architect Frank Lloyd Wright lived there and designed two dozen buildings for the village between 1890 and 1910. Its reputation was enhanced by the fact that Ernest Hemingway was born and grew up in the village. By 1970 Oak Park had an almost completely white and upper-middle and middle-class population of 60,000. Unlike affluent suburbs such as Kenilworth and Highland Park, however, Oak Park didn't have much distance between itself and the black, segregated slums of Chicago. In fact, all one had to do was cross Austin Boulevard to get from Oak Park to Chicago. Demographers and newspapers predicted that the village would soon be engulfed by Chicago's West Side. The doomsayers also pointed out that much of Oak Park's housing stock, built largely between the 1870s and the 1930s, was decaying. By the early 1970s Oak Park was indeed a "changing community," a euphemistic way of saying that blacks were moving into the village. Although some Oak Parkers opposed the influx of blacks, many of its citizens  as well as Oak Park's government  believed that the village could welcome blacks while maintaining its economic viability. Many also felt that racial diversity would be an added attraction to Oak Park. Park passed its own fair housing ordinance. In 1971, village trustees created one of the first community relations departments in Illinois to enforce the fair housing ordinance. racial diversity go hand in hand. estate agents and the village government, this not-for-profit corporation advises prospective residents, particularly renters, on the availability of housing in Oak Park. It encourages whites to move into areas that are already integrated, and blacks to live throughout the village. To promote the renewal of the village's decaying apartment buildings, the Oak Park Residence Corporation was formed in 1966. This organization manages buildings for owners who encourage racially mixed tenantry while upgrading their property. To draw attention to its showcase buildings, including those designed by Frank Lloyd Wright, the village formed the 1,000-acre Historic District in 1972. For those home owners who worried that their home values would diminish because of their black neighbors, Oak Park in 1977 became the first community in the United States to pass an Equity Assurance Plan. This plan guaranteed that any Oak Parker who sold his home at a loss would be reimbursed for 80 percent of that loss. The owner's only cost was the price of the appraisal required for participation. By 1977 these efforts had paid off for Oak Park. The village had a healthy racial and ethnic mix of people, its businesses were prospering, its historic buildings were being maintained, its older apartments were being upgraded, its schools were integrated, and there was no sign of it "tipping over" or "resegregating" into an all-black community. Many Oak Parkers felt that their village proved that racial diversity could be a boon instead of a curse and they wanted to demonstrate this to the nation. 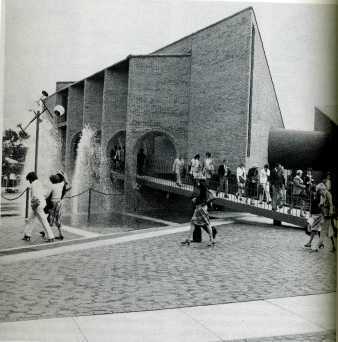 In 1977 the village's public relations consultant  The Public Relations Board in Chicago  initiated an event that would show off Oak Park's accomplishments as well as pull people together from around the nation to talk about current problems and success stories regarding racial integration. Vernette Schultz and John Cain, two Oak Parkers who work for the Public Relations Board, thought up the Oak Park Exchange Congress. "The congress' purpose was to set up goals and strategies for economic development and racial diversity," says Schlutz. "Economic development and racial diversity go hand in hand. If a community goes down the drain economically it won't be attractive to either blacks or whites." 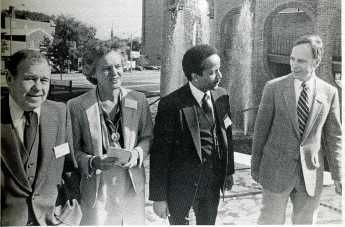 In 1977, more than 100 persons from communities around the country came to the first Oak Park Exchange Congress to discuss racial diversity, community relations, restoration of buildings and creative use of federal funding and grants. So much interest was sparked by the first congress that it was made into a yearly event to be funded by the admission fees paid by the attendees. When other communities asked to host the congress, the Oak Park president and Board of Trustees agreed that it could be held elsewhere in odd-numbered years. The third congress was held in Shaker Heights, Ohio, and the fifth in Freeport, N.Y. The congress came home again to Oak Park on October 7 and 8, 1982. Approximately 200 persons from 50 different communities in more than a dozen states attended the conference, which was held at the Oak Park Village Hall, Oak Park-River Forest High School and the West Suburban Hospital Medical Center. Among the 200 attendees were elected officials, city managers, municipal employees, business leaders and interested citizens. Few were from large cities. Most were from small and mid-sized towns and suburbs  places where a few people can have effect. Bobbie Raymond, executive director of Oak Park's successful Housing Center, was co-chairperson of the Congress. The congress was comprised of two kinds of events: all-delegate sessions and smaller-group workshops. The speakers at both kinds of events were from as close by as Oak Park, Bellwood, Park Forest and Chicago to as far away as Cleveland, Teaneck, N.J., and Freeport, N.Y. The sessions dealt with racial integration in relation to five main issues: housing, law, education, community safety and people's attitudes. Housing received the most attention and was alluded to or discussed in detail in nearly every session. "There are better guidelines in regard to housing by the federal government than there are for either employment or education," said David James, president of the North Suburban Housing Center in Wilmette. James was on the three-lawyer panel which addressed the entire assemblage at the "Legal Update" forum. The other two were Avery Friedman, chief counsel for The Housing Advocates in Cleveland, and Alexander Polikoff, executive director of Business and Professional People for the Public Interest in Chicago. The three lawyers spent nearly all of their hour and a half discussing the law as it relates to fair housing. "With the passage of the Fair Housing Act in 1968, the federal government declared its interest that discrimination not go on within its borders," said Polikoff. This act makes it illegal to bar or steer any person away from the housing of his or her choice. Meetings and workshops were held at several Oak Park locations. Sherlynn Reid (center), director of community relations for the Village, moderated this discussion on fair housing at the local high school. Although American society as a whole must share the blame for creating a climate conducive to racial segregation, the real estate industry in particular is often blamed for using that climate to create segregated cities and neighborhoods. Open housing advocates have long maintained that real estate companies have profited by steering persons towards or away from given areas based on race. Proving this has been difficult, however. One way to gather proof is by "testing" realtors. This involves sending white and black persons to the same realtor. The persons pretend to be looking for housing. If blacks are consistently shown one neighborhood and whites another, it would appear that the realtor is using race as a criterion in showing properties. Legal action can then be taken through the U.S. Housing and Urban Development Department (HUD), through private suits filed in a federal district court, or in class action suits filed with the U.S. attorney general. In Illinois, housing discrimination grievances can also be filed with the Illinois Department of Human Rights. Fair-housing advocates, including people engaged in "testing," lauded two recent U.S. Supreme Court decisions. In 1979 the U.S. Supreme Court decided in Gladstone, Realtors v. Village of Bellwood (Illinois) that municipalities and residents of municipalities have a right to sue when real estate practices threaten to rob an integrated community of its racial balance. In February of 1982, in Havens Realty Corporation v. Coleman, the U.S. Supreme Court unanimously ruled that testers given false information have standing to use in their own right even though "the tester may have approached the real estate agent fully expecting that he would receive false information, and without any intention of buying or renting a home." In addition, the Havens decision maintained that a fair-housing organization engaged in counseling activities (in this case the Housing Opportunities Made Equal organization of Richmond, Va.) can sue for violations of the Fair Housing Act. Christine Klepper, director of the South Suburban Housing Center in Park Forest, spoke at the conference about her organization's testing efforts. "In 1979, 88 percent of our white testers were shown only white areas. Only 2 percent of the black testers were shown only white areas." Klepper, who made her remarks at the "South Suburban Story" session, added: "We sued 15 real estate companies. When we went back and tested some of those realtors in 1981 we found many of them doing a better job. We file complaints and suits in a multitude of places, including the Board of Realtors, HUD, the Department of Human Rights for the state of Illinois, the Illinois Department of Registration and Education, and federal courts. We're coming up with some really exciting lawsuits right now." 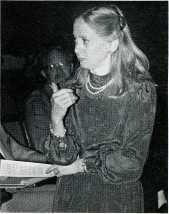 A testing program that attracted great interest at the conference was the one conducted by the Calvin College Social Research Center in Grand Rapids, Mich., in 1980 and 1981. Generally, the real estate industry does not know about testing programs until they're slapped with a complaint. An unusual aspect of the Grand Rapids testing program was that the Grand Rapids Real Estate Board financed it, along with the Ford Foundation. After holding training sessions designed to remind real estate agents of their fair housing responsibilities, the Social Research Center sent out approximately 130 black and white testers to 100 agents. "Fifteen of the agents were found to have serious violations of the law and of the national real estate code," explained Anne E. Schreuder of the Social Research Center. "Those cases are in the process of being heard by the Real Estate Board's Professional Standards Committee, which can take disciplinary action against the offenders." The Social Research Center is interested in more than punishing offenders. "We are interested in developing educational programs and then going back to the agents and retesting them," said Schreuder. "We are also in the process of asking for Ford Foundation funding to replicate this testing program in five metropolitan areas throughout the United States." Other persons at the conference also reported a mood of cooperation between fair-housing advocates and the real estate industry in certain localities. "The Oak Park Housing Center and the Village of Oak Park have maintained a good relationship for more than 10 years with the real estate community in regard to working together for racial integration," said Bobbie Raymond, executive director of the Oak Park Housing Center and co-chairperson of the conference. To say the least, however, all is not rosy between fair-housing advocates and real estate people. "It's true that at local levels in Oak Park and in other communities realtors cooperate in maintaining an open housing market," said Kale Williams, executive director of the Leadership Council for Metropolitan Open Communities in Chicago. "But the organized real estate industry at its upper levels has taken it as a very high priority to attack integrated communities." Lawyer Avery Friedman used even stronger language, saying that the real estate industry is making "orchestrated, methodical, direct, malicious and outright assaults" on fair-housing advocates and organizations. Harvard Law Review in 1980 called "benign steering" and "benign quotas." When a government or private agency suggests that people consider moving to certain areas for the sake of racial integration, that can be called "benign steering." When a government or private agency computes what it considers ideal integration percentages, that may be called a "benign quota." In 1977 the village of Park Forest South passed an ordinance encouraging realtors to submit affirmative marketing plans to promote stable racial integration. Park Forest South had a black population of 25 percent, as opposed to 20 percent in the metropolitan area. The village feared that, unless whites continued to compete for housing, there would be an inevitable trend towards a resegregated black community. Realtors complained to HUD that this ordinance was an effort to require them to recruit whites, and the ordinance was rescinded. Cleveland Heights, Ohio, is a city of 60,000. Its black population was 2.5 percent in 1970 and 25 percent in 1980. Committed to maintaining its integrated status, the government of this Cleveland suburb encouraged realtors to make sure that blacks and whites  rather than just blacks  moved into the city. In September of 1980 two black Cleveland Heights residents filed a suit claiming that the city was using tax dollars to recruit whites while limiting the number of blacks who moved in. The organized state, local and national real estate industry supported the suit, which is pending in federal district court. Conference attendees viewed this suit as an extremely serious attack upon the concept of integration management. Among the delegates were (from left) Mayor Charles Grimm, Ferguson, Mo. ; Pres. Sara Bode, Oak Park; Pres. Ronald Bean, Park Forest, Ill.; and Mayor Brandon Wiers, Forest Park, Ohio. To summarize, recent events indicate that, despite cooperation between fair-housing advocates and the real estate industry in places, these two traditional adversaries have each added to their arsenals. Thanks to the Bellwood and Havens decisions, municipalities, fair-housing organizations and testers can gather evidence against realtors and sue them. In return, the real estate industry is using the very language of the Fair Housing Law to attack integration maintenance systems. Two things about the battles between realtors and fair-housing advocates alarmed people at the conference. First, many consider the language and enforcement of the Fair Housing Law inadequate. "We've had a Fair Housing Law since 1968 with the intent of demolishing closed ghettoes," said Michael Kirwan, director of the Human Relations Commission in Freeport, N.Y. "We need stronger teeth in the law, but even as it stands it's not enforced at all." A 1979 report by the U.S. Commission on Civil Rights also concluded that the Fair Housing Act of 1968 is not enforced by federal agencies and lacks effective enforcement mechanisms. If the real estate industry successfully attacks fair housing advocates over the existing law, the chances for an even stronger law may be diminished. Dennis B. Fradin is a free-lance writer and has authored several articles for Illinois Issues.